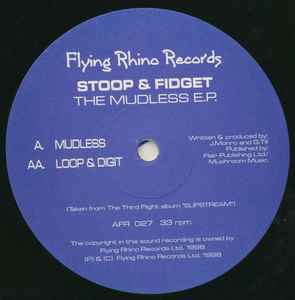 Stoop & Fidget ‎– The Mudless E.P. Taken from The Third Flight album "Slipstream". Great synth rhythm with dissonant, unrelated sounds run over the top. Not my cup of tea. Mudless was an absolute monster, and along with Loop and Digit the two tracks on this EP really were like nothing else around at the time. A very progressive style is the only way to really describe it but it keeps that psychedelic flavour throughout - very 'epic'. The first time I recall hearing this out was one night in the late 90's in London (Cloud 9 in the Vauxhall arches I think) along with the rest of the Slipstream album, and a couple of tracks (Morphog and Yeti) from the Tip 'Trance De Eivissa' album. It changed things for me musically for some time afterwards, as the tracks all seemed to be very original in their approach, and drew influences from the Goa sound but also from many different genres and styles of electronic music. The most memorable time was when it got dropped at a big outdoor party near the M25 - BOM!!. I was a big Gus 'Bus' Till fan back then and his sets were brilliant and had a totally unique style for the time which really comes across in this track. Just like 'Klein Aber Doctor', if you drop this today (i've seen it done) there is no doubt it will rock the dance floor just like it did all those years ago. Certainly a refreshing change to the copy/paste psy-trance style we seem to get a lot of these days... this came from a time when pretty much every psy-trance act had their own individual sound.